Dashboard Shows ATR Data from monthly to minute time frame across 15 different instruments (customizable) at the same time. User can select maximum 4 time frames (customizable) to scan across 15 instruments simultaneously. ATR data helps to check volatility across different instruments & different time frames (with customizable ATR periods for individual time frames). Works with all types of Instruments. The user can plot multiple dashboard on the Same chart. 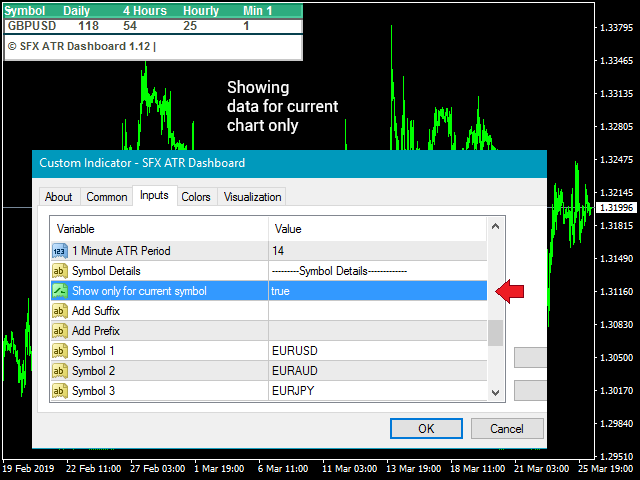 Option to show multi-time frame ATR data for current chart only. Note! If the user wants to use multiple dashboards on the same chart, then the user needs to input different custom indicator name for each dashboard. ATR Dashboard a very useful tool for comprehensive analysis of the market. Very Well. ATR Dashboard очень полезный инструмент для всестороннего анализа рынка. Очень Хорошо. Option added to show ATR data for current chart only. Color layout changed, icon changed. Custom X axis and Y axis position added for the user to move the dashboard on the chart to any preferable places. Custom Indicator Name field added for the user to add multiple dashboards on the chart. Now user can choose 4 time frames atr data among 8 different available time frames. User can also choose different atr period for different time frame settings. Horizontal line added. Custom chart name option added. Code restructured to solve freezing problem. New Features added: Dashboard size get auto resized based on the number of instruments. Indicator loading faster than before. Code optimised. Can be used for all instruments. No False data at blank instrument place. No of pair decreased for faster loading. Prefix & Suffix added for pairs. Now it shows 22 Pairs. More pairs added. Now it shows up to 20 pairs.